"Ben Gurion" redirects here. For other uses, see Ben Gurion (disambiguation). 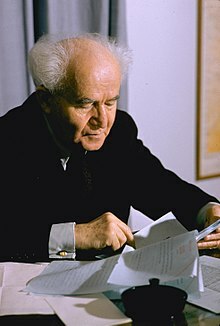 David Ben-Gurion (Hebrew : דָּוִד בֶּן-גּוּרִיּוֹן‎; pronounced [daˈvɪd ben gurˈjo:n]( listen ), born David Grün; 16 October 1886 – 1 December 1973) was the primary national founder of the State of Israel and the first Prime Minister of Israel. Zionism is the nationalist movement of the Jewish people that supports the re-establishment of a Jewish homeland in the territory defined as the historic Land of Israel. Modern Zionism emerged in the late 19th century in Central and Eastern Europe as a national revival movement, both in reaction to newer waves of antisemitism and as an imitative response to other nationalist movements. Soon after this, most leaders of the movement associated the main goal with creating the desired state in Palestine, then an area controlled by the Ottoman Empire. The World Zionist Organization, or WZO, is a non-governmental organization that promotes Zionism. It was founded as the Zionist Organization at the initiative of Theodor Herzl at the First World Zionist Congress, which took place in August 1897 in Basel, Switzerland. When it was founded, the goals of the Zionist movement were stated in a resolution that came of that Congress and came to be known as the Basel Program. preparatory steps for the attainment of those governmental grants which are necessary to the achievement of the Zionist purpose. The Yishuv or Ha-Yishuv or Ha-Yishuv Ha-Ivri is the term referring to the body of Jewish residents in the land of Israel prior to the establishment of the State of Israel. The term came into use in the 1880s, when there were about 25,000 Jews living across the Land of Israel, then comprising the southern part of Ottoman Syria, and continued to be used until 1948, by which time there were some 630,000 Jews there. The term is used in Hebrew even nowadays to denote the Pre-State Jewish residents in the Land of Israel. Aliyah is the immigration of Jews from the diaspora to the Land of Israel. Also defined as "the act of going up"—that is, towards Jerusalem—"making Aliyah" by moving to the Land of Israel is one of the most basic tenets of Zionism. The opposite action, emigration from the Land of Israel, is referred to in Hebrew as yerida ("descent"). The State of Israel's Law of Return gives Jews and their descendants automatic rights regarding residency and Israeli citizenship. 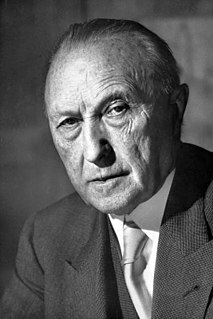 Konrad Hermann Joseph Adenauer was a German statesman who served as the first Chancellor of the Federal Republic of Germany from 1949 to 1963. He was co-founder and first leader of the Christian Democratic Union (CDU), a Christian Democratic party that under his leadership became one of the most influential parties in the country. In 1954 he resigned as both Prime Minister and Minister of Defense, although he remained a member of the Knesset. However, he returned as Minister of Defense in 1955 after the Lavon Affair resulted in the resignation of Pinhas Lavon. Later in the year he became Prime Minister again, following the 1955 elections. Under his leadership, Israel responded aggressively to Arab guerrilla attacks, and in 1956, invaded Egypt along with British and French forces after Egypt nationalized the Suez Canal during what became known as the Suez Crisis. The Lavon affair refers to a failed Israeli covert operation, codenamed Operation Susannah, conducted in Egypt in the summer of 1954. As part of the false flag operation, a group of Egyptian Jews were recruited by Israeli military intelligence to plant bombs inside Egyptian-, American-, and British-owned civilian targets: cinemas, libraries and American educational centers. The bombs were timed to detonate several hours after closing time. The attacks were to be blamed on the Muslim Brotherhood, Egyptian Communists, "unspecified malcontents" or "local nationalists" with the aim of creating a climate of sufficient violence and instability to induce the British government to retain its occupying troops in Egypt's Suez Canal zone. The operation caused no casualties among the population, but cost the lives of four operatives: two cell members who committed suicide after being captured; and two operatives who were tried, convicted, and executed by the Egyptian authorities. Pinhas Lavon was an Israeli politician, minister and labor leader, best known for the Lavon Affair. He stepped down from office in 1963, and retired from political life in 1970. He then moved to Sde Boker, a kibbutz in the Negev desert, where he lived until his death. 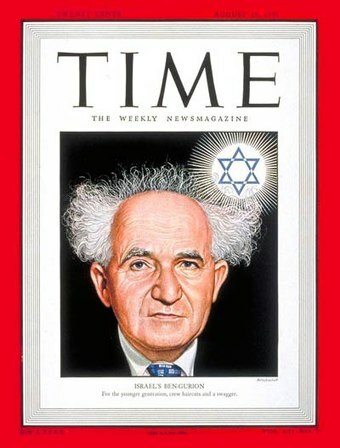 Posthumously, Ben-Gurion was named one of Time magazine's 100 Most Important People of the 20th century. Sde Boker is a kibbutz in the Negev desert of southern Israel. Best known as the retirement home of Israel's first Prime Minister, David Ben-Gurion, it falls under the jurisdiction of Ramat Negev Regional Council. In 2017 it had a population of 432. The Negev is a desert and semidesert region of southern Israel. The region's largest city and administrative capital is Beersheba, in the north. At its southern end is the Gulf of Aqaba and the resort city of Eilat. It contains several development towns, including Dimona, Arad and Mitzpe Ramon, as well as a number of small Bedouin cities, including Rahat and Tel as-Sabi and Lakyah. There are also several kibbutzim, including Revivim and Sde Boker; the latter became the home of Israel's first Prime Minister, David Ben-Gurion, after his retirement from politics. David Ben-Gurion Square—site of the no longer existing house where Ben-Gurion was born, Płońsk, Wspólna Street. 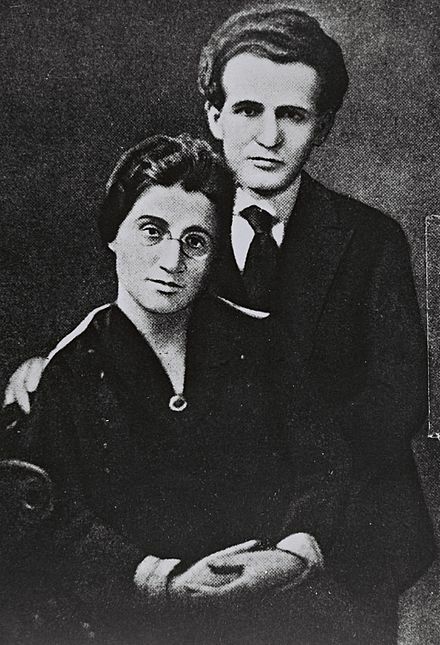 David and Paula Ben-Gurion, 1 June 1918. 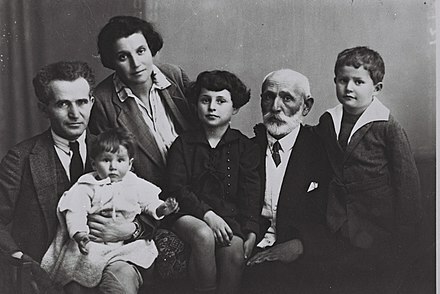 David Ben-Gurion was born in Płońsk in Congress Poland – then part of the Russian Empire. His father, Avigdor Grün, was a lawyer and a leader in the Hovevei Zion movement. His mother, Scheindel (Broitman),  died when he was 11 years old. Ben-Gurion's birth certificate, when rediscovered in Poland in 2003, indicated that he had a twin brother who died shortly after birth. At the age of 14 he and two friends formed a youth club, Ezra, promoting Hebrew studies and emigration to the Holy Land. Płońsk(listen) is a town in north-central Poland with 22,500 inhabitants (2010). It is situated in the Masovian Voivodeship at the river Płonka; previously, it was in Ciechanów Voivodeship (1975–98). The city is noted for being the birthplace of Israeli Prime Minister David Ben-Gurion, for whom a square is named. The Kingdom of Poland, informally known as Congress Poland or Russian Poland, was created in 1815 by the Congress of Vienna as a sovereign state of the Russian partition of Poland. Connected until 1832 by personal union with the Russian Empire under the Constitution of the Kingdom of Poland, it was gradually thereafter integrated politically into Russia over the course of the 19th century, made an official part of the Russian Empire in 1867, and finally replaced during World War I by the Central Powers in 1915 with the nominal Regency Kingdom of Poland. In 1912, he moved to Constantinople, the Ottoman capital, to study law at Istanbul University together with Yitzhak Ben-Zvi, and adopted the Hebrew name Ben-Gurion, after the Jewish leading figure Yosef ben Gurion from the Great Jewish Revolt against the Romans. He also worked as a journalist. Ben-Gurion saw the future as dependent on the Ottoman regime. After the Balfour Declaration of November 1917, the situation changed dramatically and in 1918 Ben-Gurion, with the interest of Zionism in mind, switched sides and joined the newly formed Jewish Legion of the British Army. 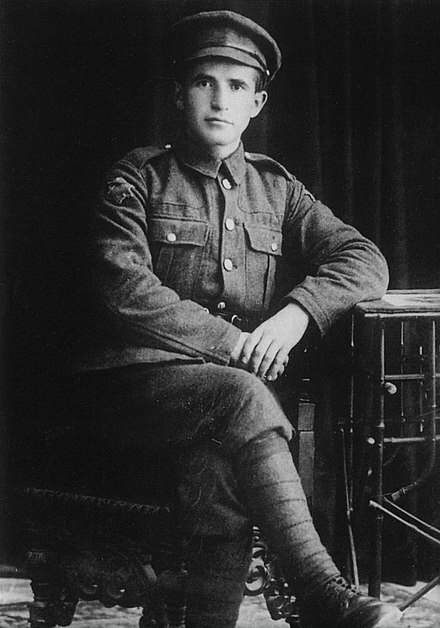 He volunteered for the 38th Battalion, Royal Fusiliers, one of the four which constituted the Jewish Legion. His unit fought against the Turks as part of Chaytor's Force during the Palestine Campaign. Ben-Gurion and his family returned permanently to Palestine after World War I following its conquest by the British from the Ottoman Empire. In 1930, Hapoel Hatzair (founded by A. D. Gordon in 1905) and Ahdut HaAvoda joined forces to create Mapai, the more moderate Zionist labor party (it was still a left-wing organization, but not as far-left as other factions) under Ben-Gurion's leadership. In the 1940s the left-wing of Mapai broke away to form Mapam. Labor Zionism became the dominant tendency in the World Zionist Organization and in 1935 Ben-Gurion became chairman of the executive committee of the Jewish Agency, a role he kept until the creation of the state of Israel in 1948. During the 1936–1939 Arab revolt in Palestine, Ben-Gurion instigated a policy of restraint ("Havlagah") in which the Haganah and other Jewish groups did not retaliate for Arab attacks against Jewish civilians, concentrating only on self-defense. In 1937, the Peel Commission recommended partitioning Palestine into Jewish and Arab areas and Ben-Gurion supported this policy. This led to conflict with Ze'ev Jabotinsky who opposed partition and as a result Jabotinsky's supporters split with the Haganah and abandoned Havlagah. During the Second World War, Ben-Gurion encouraged the Jewish population to volunteer for the British Army. He famously told Jews to "support the British as if there is no White Paper and oppose the White Paper as if there is no war". About 10% of the Jewish population of Palestine volunteered for the British Army, including many women. At the same time Ben-Gurion assisted the illegal immigration of thousands of European Jewish refugees to Palestine during a period when the British placed heavy restrictions on Jewish immigration. Due to the Jewish insurgency in Palestine, bad publicity over the restriction of Jewish immigrants to Palestine, non-acceptance of a partitioned state (as suggested by the United Nations) amongst Arabs residents, and the cost of keeping 100,000 troops in Palestine the British Government referred the matter to the United Nations. The British were against the partition plan and announced they would hand the Mandate over to the U.N. on 15 May 1948. However, on 14 May the Israeli Declaration of Independence was unilaterally declared, leading to the 1948 Palestinian exodus. In order to prevent the coalescence of the religious right, the Hisdadrut agreed to a vague "status quo" agreement with Mizrahi in 1935. To a large extent this agreement provided the framework for religious affairs in Israel till the present day, and is often used as a benchmark regarding the arrangement of religious affairs in Israel. 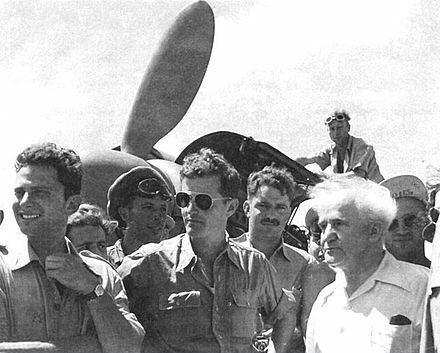 David Ben-Gurion visits 101 Squadron, the "First Fighter Squadron". During the 1948 Arab–Israeli War Ben-Gurion oversaw the nascent state's military operations. During the first weeks of Israel's independence, he ordered all militias to be replaced by one national army, the Israel Defense Forces (IDF). To that end, Ben-Gurion used a firm hand during the Altalena Affair, a ship carrying arms purchased by the Irgun led by Menachem Begin. He insisted that all weapons be handed over to the IDF. When fighting broke out on the Tel Aviv beach he ordered it be taken by force and to shell the ship. Sixteen Irgun fighters and three IDF soldiers were killed in this battle. Following the policy of a unified military force, he also ordered that the Palmach headquarters be disbanded and its units be integrated with the rest of the IDF, to the chagrin of many of its members. By absorbing the Irgun force into Israel's IDF, the Israelis eliminated competition and the central government controlled all military forces within the country. His attempts to reduce the number of Mapam members in the senior ranks led to the "Generals' Revolt" in June 1948. 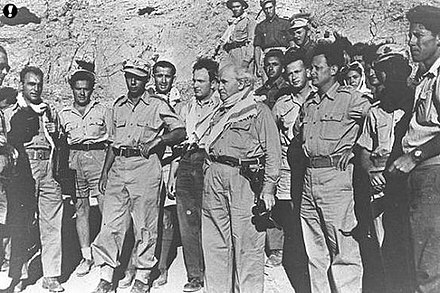 David Ben-Gurion with Yigal Allon and Yitzhak Rabin in the Negev, during the 1948 Arab–Israeli War. On 14 May 1948, on the last day of the British Mandate, Ben-Gurion declared the independence of the state of Israel. In the Israeli declaration of independence, he stated that the new nation would "uphold the full social and political equality of all its citizens, without distinction of religion, race". During this period, Palestinian fedayeen repeatedly infiltrated into Israel from Arab territory. In 1953, after a handful of unsuccessful retaliatory actions, Ben-Gurion charged Ariel Sharon, then security chief of the northern region, with setting up a new commando unit designed to respond to fedayeen infiltrations. Ben-Gurion told Sharon, "The Palestinians must learn that they will pay a high price for Israeli lives." Sharon formed Unit 101, a small commando unit answerable directly to the IDF General Staff tasked with retaliating for fedayeen raids. During its five months of existence, the unit launched repeated raids against military targets and villages used as bases by the fedayeen. These attacks became known as the reprisal operations. 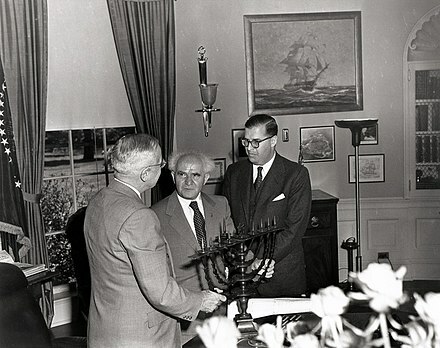 U.S. President Harry S. Truman in the Oval Office, receiving a Menorah as a gift from the Prime Minister of Israel, David Ben-Gurion (center). To the right is Abba Eban, the Ambassador of Israel to the United States. Ben-Gurion returned to government in 1955. He assumed the post of Defense Minister and was soon re-elected prime minister. When Ben-Gurion returned to government, Israeli forces began responding more aggressively to Egyptian-sponsored Palestinian guerilla attacks from Gaza—still under Egyptian rule. Egypt's President Gamal Abdel Nasser signed the Egyptian-Czech arms deal and purchased a large amount of modern arms. The Israelis responded by arming themselves with help from France. Nasser blocked the passage of Israeli ships through the Straits of Tiran and the Suez Canal. In July 1956, the United States and Britain withdrew their offer to fund the Aswan High Dam project on the Nile and a week later, Nasser ordered the nationalization of the French and British-controlled Suez Canal. In late 1956, the bellicosity of statements Arab prompted Israel to remove the threat of the concentrated Egyptian forces in the Sinai, and Israel invaded the Egyptian Sinai peninsula. Other Israeli aims were elimination of the Fedayeen incursions into Israel that made life unbearable for its southern population, and opening the blockaded Straits of Tiran for Israeli ships. Israel occupied much of the peninsula within a few days. As agreed beforehand, within a couple of days, Britain and France invaded too, aiming at regaining Western control of the Suez Canal and removing the Egyptian president Nasser. The United States pressure forced the British and French to back down and Israel to withdraw from Sinai in return for free Israeli navigation through the Red Sea. The United Nations responded by establishing its first peacekeeping force, (UNEF). It was stationed between Egypt and Israel and for the next decade it maintained peace and stopped the Fedayeen incursions into Israel. In 1959, David Ben-Gurion learned from West German officials of reports that the notorious Nazi war criminal, Adolf Eichmann, was likely living in hiding in Argentina. In response, Ben-Gurion ordered the Israel foreign intelligence service, the Mossad, to capture the international fugitive alive for trial in Israel. In 1960, this mission was accomplished and Eichmann was tried and convicted in an internationally publicized trial for various offenses including crimes against humanity, and was subsequently executed in 1962. Ben-Gurion stepped down as prime minister for personal reasons in 1963, and chose Levi Eshkol as his successor. A year later a rivalry developed between the two on the issue of the Lavon Affair, a failed 1954 Israeli covert operation in Egypt. Ben-Gurion had insisted that the operation be properly investigated, while Eshkol refused. Ben-Gurion subsequently broke with Mapai in June 1965 and formed a new party, Rafi, while Mapai merged with Ahdut HaAvoda to form Alignment, with Eshkol as its head. Alignment defeated Rafi in the November 1965 election, establishing Eshkol as the country's leader. Following the Six-Day War, Ben-Gurion criticized what he saw as the government's apathy towards the construction and development of the city. To ensure that a united Jerusalem remained in Israeli hands, he advocated a massive Jewish settlement program for the Old City and the hills surrounding the city, as well as the establishment of large industries in the Jerusalem area to attract Jewish migrants. He argued that no Arabs would have to be evicted in the process. Ben-Gurion also urged extensive Jewish settlement in Hebron. In 1968, when Rafi merged with Mapai to form the Alignment, Ben-Gurion refused to reconcile with his old party. He favoured electoral reforms in which a constituency-based system would replace what he saw as a chaotic proportional representation method. He formed another new party, the National List, which won four seats in the 1969 election. Ben-Gurion retired from politics in 1970 and spent his last years living in a modest home on the kibbutz, working on an 11-volume history of Israel's early years. In 1971, he visited Israeli positions along the Suez Canal during the War of Attrition. On 18 November 1973, Ben-Gurion suffered a cerebral hemorrhage, and was taken to Sheba Medical Center in Tel HaShomer, Ramat Gan. During the first week following the stroke, he received visits from many high-ranking officials, including Prime Minister Golda Meir. His condition began deteriorating on 23 November, and he died on 1 December at age 87. His stroke and death took place during the immediate aftermath of the Yom Kippur War. As he was dying, his grandson Alon, who fought as a paratrooper in the war, was also hospitalized for shrapnel wounds sustained in combat. His body lay in state in the Knesset compound before being flown by helicopter to Sde Boker. Sirens sounded across the entire country to mark his death. He was buried in a simple funeral alongside his wife Paula at Midreshet Ben-Gurion. Israel's largest airport, Ben Gurion International Airport, is named in his honor. One of Israel's major universities, Ben-Gurion University of the Negev, located in Beersheva, is named after him. Numerous streets, as well as schools, throughout Israel have been named after him. Ben-Gurion's Hut in Kibbutz Sde Boker which is now a visitors center. A desert research center, Midreshet Ben-Gurion, near his "hut" in Kibbutz Sde Boker has been named in his honor. Ben-Gurion's grave is in the research center. Moshe Sharett was the second Prime Minister of Israel (1954–55), serving for a little under two years between David Ben-Gurion's two terms. He continued as Foreign Minister (1955–56) in the Mapai government. The history of the Israel Defense Forces (IDF) intertwines in its early stages with history of the Haganah. Binyamin Gibli was the head of Israeli Military Intelligence from June 1950 to March 1955. Gibli was forced to resign in the wake of the Lavon Affair, a failed Israeli operation in Egypt in 1954. Meir Tobianski also Tubianski was an officer in the Israel Defense Forces (IDF) who was executed as a traitor on circumstantial evidence on the orders of Isser Be'eri, the first director of the IDF's intelligence branch. A year after the execution, Tobianski was exonerated of all charges. HeHalutz or Hechalutz was a Jewish youth movement that trained young people for agricultural settlement in the Land of Israel. It became an umbrella organization of the pioneering Zionist youth movements. "Hebrew labor" is a term referring to the ideal adopted by some Jews in Ottoman and Mandate Palestine during the late 19th and early 20th centuries to favour hiring Jewish rather than non-Jewish workers. Reprisal operations were raids carried out by the Israel Defense Forces in the 1950s and 1960s in response to frequent fedayeen attacks during which armed Arab militants infiltrated Israel from Syria, Egypt and Jordan to carry out attacks on Israeli civilians and soldiers. Most of the reprisal operations followed raids that resulted in Israeli fatalities. The goal of these operations was to create deterrence and prevent future attacks. Two other factors behind the raids were restoring public morale and training newly formed army units. Shlomo Kaplansky was a Labour Zionist politician, who served as the secretary of the World Union of Poalei Zion. During the 1920s he was a leading advocate of a bi-national state in Palestine. Events in the year 1950 in Israel. Shabtai Teveth, was an Israeli historian and an anti-Revisionist author. Palestinian Fedayeen insurgency refers to the armed cross-border conflict, which peaked between 1949 and 1956, involving Israel and Palestinian militants, mainly based in the Gaza Strip, the sole territory of the All-Palestine Protectorate – a Palestinian state declared in October 1948, which became the focal point of the Palestinian fedayeen activity. The conflict was parallel to the Palestinian infiltration phenomenon. Hundreds were killed on the course of the conflict, which declined after the 1956 Suez War. The 1937 Ben-Gurion letter is a letter written by David Ben-Gurion, then head of the executive committee of the Jewish Agency, to his son Amos on 5 October 1937. 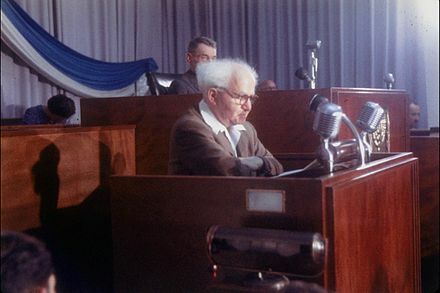 The letter is well known by scholars as it provides insight into Ben-Gurion's reaction to the report of the Peel Commission released on 7 July of the same year. It has also been subject to significant debate by scholars as a result of scribbled-out text that may or may not provide written evidence of an intention to "expel the Arabs" or "not expel the Arabs" depending on one's interpretation of whether such deletion was intended by Ben-Gurion. ↑ "1973: Israel's founding father dies". 1 December 1973. Retrieved 31 August 2018– via news.bbc.co.uk. ↑ "Avotaynu: The International Review of Jewish Genealogy". G. Mokotoff. 31 August 2018. Retrieved 31 August 2018– via Google Books. ↑ "Ben-Gurion may have been a twin". Haaretz. ↑ Memoirs : David Ben-Gurion (1970), p. 36. ↑ Teveth, Shabtai (1985) Ben-Gurion and the Palestinian Arabs. From Peace to War. Oxford University Press. ISBN 0-19-503562-3. Ezra – pp. 3, 4; Paolei Zion – p. 6; central committee – p. 9; populations—pp. 10, 21; Galilee pp. 12, 14–15. ↑ Teveth, Shabtai (1985) Ben-Gurion and the Palestinian Arabs. From Peace to War. Oxford University Press. ISBN 0-19-503562-3. pp. 25, 26. 1 2 "Mary Ben-Gurion (biographical details)". cosmos.ucc.ie. Retrieved 31 August 2018. ↑ "Amos Ben-Gurion (biographical details)". cosmos.ucc.ie. Retrieved 31 August 2018. ↑ Beckerman, Gal (29 May 2006). "The apples sometimes fall far from the tree". The Jerusalem Post. ↑ Morris, Benny (3 October 2002). "Two years of the intifada – A new exodus for the Middle East?". The Guardian. Retrieved 30 August 2010. ↑ "Ben-gurion Reveals Suggestion of North Vietnam's Communist Leader". Jewish Telegraphic Agency. 8 November 1966. Retrieved 5 September 2015. ↑ "ISRAEL WAS EVERYTHING". Nytimes.com. 21 June 1987. Retrieved 5 September 2015. ↑ "Secrets of Ben-Gurion's Leadership". Forward.com. Retrieved 2015-05-17. ↑ Efraim Karsh, "Fabricating Israeli history: the 'new historians'", Edition 2, Routledge, 2000, ISBN 978-0-7146-5011-1, p. 213. ↑ Teveth, Shabtai (1985) Ben-Gurion and the Palestinian Arabs. From Peace to War. Oxford University Press. ISBN 0-19-503562-3. p. 118. ↑ "Ben-Gurion's road to the State" (in Hebrew). Ben-Gurion Archives. Archived from the original on 15 February 2006. ↑ Paul Johnson, A History of the Jews, p. 523. ↑ Benny Morris (2008), pp. 315–316. ↑ Benny Morris (2008), pp. 317. ↑ Uri Ben-Eliezer, The Making of Israeli Militarism, Indiana University Press, 1998, p.185 writes: "Ben-Gurion describes to the Minister his plans to conquer the entire West Bank, involving warfare against entire Jordan's Arab Legion, but to his surprise the Ministers rejected his proposal." ↑ "Ben Gurion proposal to conquer Latrun, the cabinet meeting, 26 sept 1948 (hebrew)". Israel state archive blog:. israelidocuments.blogspot.co.il/2015/02/1948.html (Hebrew). 1 2 Benny Morris (2008), p. 318. ↑ Mordechai Bar-On, Never-Ending Conflict: Israeli Military History, Stackpole Books, 2006, p.60 writes : "Originally, this was an idiom that Ben-Gurion used after the government rejected his demand to attack the Legion and occupy Samaria in the wake of a Mujuhidin's attack near Latrun in September 1948. ↑ Yoav Gelber, Israeli-Jordanian Dialogue, 1948–1953, Sussex Academic Press, 2004, p.2. ↑ Benny Morris (2008), pp. 315. ↑ David Tal (24 June 2004). War in Palestine, 1948: Israeli and Arab Strategy and Diplomacy. Routledge. pp. 406–407. ISBN 978-1-135-77513-1. Nothing of this sort appears in the diary he kept at the time or in the minutes of the Cabinet meeting from which he is ostensibly quoting... Ben Gurion once more raised the idea of conquering Latrun in the cabinet. Ben Gurion was in fact reacting to what he had been told by a delegation from Jerusalem... The "everlasting shame" view is unsubstantiated in both Ben Gurion's diary and in the Cabinet protocol. ↑ Anita Shapira (25 November 2014). Ben-Gurion: Father of Modern Israel. Yale University Press. pp. 173–. ISBN 978-0-300-18273-6. "(Ben Gurion) He also did not flinch from provoking the United Nations by breaking the truce agreement. But the limit of his fearlessness was a clash with a Western power. Vainly, the right and Mapam accused him of defeatism. He did not flinch from confronting them but chose to maintain good relations with the United States, which he perceived as a potential ally of the new state, and also not to provoke the British lion, even though its fangs had been drawn. At the end of the war, when Yigal Allon, who represented the younger generation of commanders that had grown up in the war, demanded the conquest of the West Bank up to the Jordan River as the natural, defensible border of the state, Ben-Gurion refused. He recognized that the IDF was militarily strong enough to carry out the conquest, but he believed that the young state should not bite off more than it had already chewed. There was a limit to what the world was prepared to accept. Furthermore, the armistice borders—which later became known as the Green Line—were better than those he had dreamed of at the beginning of the war. In Ben-Gurion's opinion, in terms of territory Israel was satisfied. It was time to send the troops home and start work on building the new nation. ↑ Ari Shavit, Survival of the fittest : An Interview with Benny Morris, Ha'aretz Friday Magazine, 9 January 2004. ↑ "Biography: David Ben-Gurion: For the Love of Zion". www.vision.org. Retrieved 31 August 2018. ↑ Michael Prior (12 November 2012). Zionism and the State of Israel: A Moral Inquiry. Routledge. pp. 293–. ISBN 978-1-134-62877-3 . Retrieved 20 May 2013. ↑ "The Free Lance-Star - Google News Archive Search". news.google.com. Retrieved 31 August 2018. 1 2 Tsameret, Tsevi; Tlamim, Moshe (1 July 1999). "Judaism in Israel: Ben-Gurion's Private Beliefs and Public Policy". Israel Studies. 4 (2): 64–89. doi:10.1353/is.1999.0016 . Retrieved 31 August 2018– via Project MUSE. ↑ Ari Shavit 'Survival of the fittest,' Haaretz 8 January 2004:"The worst cases were Saliha (70–80 killed), Deir Yassin (100–110), Lod (250), Dawayima (hundreds) and perhaps Abu Shusha (70). There is no unequivocal proof of a large-scale massacre at Tantura, but war crimes were perpetrated there. At Jaffa there was a massacre about which nothing had been known until now. The same at Arab al Muwassi, in the north. About half of the acts of massacre were part of Operation Hiram [in the north, in October 1948]: at Safsaf, Saliha, Jish, Eilaboun, Arab al Muwasi, Deir al Asad, Majdal Krum, Sasa. In Operation Hiram there was a unusually high concentration of executions of people against a wall or next to a well in an orderly fashion.That can't be chance. It's a pattern. Apparently, various officers who took part in the operation understood that the expulsion order they received permitted them to do these deeds in order to encourage the population to take to the roads. The fact is that no one was punished for these acts of murder. Ben-Gurion silenced the matter. He covered up for the officers who did the massacres." 1 2 David Ben-Gurion (17 January 1955). "Importance of the Negev" (in Hebrew). Archived from the original on 23 February 2007. ↑ "Unit 101 (Israel) | Specwar.info ||". En.specwar.info. Retrieved 9 September 2012. ↑ Moshe Shemesh; Selwyn Illan Troen (5 October 2005). The Suez-Sinai Crisis: A Retrospective and Reappraisal. Routledge. p. 5. ISBN 978-1-135-77863-7. The aims were to be threefold: to remove the threat, wholly or partially, of the Egyptian rmy in the Sinai, to destroy the framework of the fedaiyyun, and to secure the freedom of navigation through the straits of Tiran. ↑ Isaac Alteras (1993). Eisenhower and Israel: U.S.-Israeli Relations, 1953–1960. University Press of Florida. pp. 192–. ISBN 978-0-8130-1205-6. the removal of the Egyptian blockade of the Straits of Tiran at the entrance of the Gulf of Aqaba. The blockade closed Israel’s sea lane to East Africa and the Far East, hindering the development of Israel’s southern port of Eilat and its hinterland, the Nege. Another important objective of the Israeli war plan was the elimination of the terrorist bases in the Gaza Strip, from which daily fedayeen incursions into Israel made life unbearable for its southern population. And last but not least, the concentration of the Egyptian forces in the Sinai Peninsula, armed with the newly acquired weapons from the Soviet bloc, prepared for an attack on Israel. Here, Ben-Gurion believed, was a time bomb that had to be defused before it was too late. Reaching the Suez Canal did not figure at all in Israel’s war objectives. ↑ Dominic Joseph Caraccilo (January 2011). Beyond Guns and Steel: A War Termination Strategy. ABC-CLIO. pp. 113–. ISBN 978-0-313-39149-1. The escalation continued with the Egyptian blockade of the Straits of Tiran, and Nasser's nationalization of the Suez Canal in July 1956. On October 14, Nasser made clear his intent:"I am not solely fighting against Israel itself. My task is to deliver the Arab world from destruction through Israel's intrigue, which has its roots abroad. Our hatred is very strong. There is no sense in talking about peace with Israel. There is not even the smallest place for negotiations." Less than two weeks later, on October 25, Egypt signed a tripartite agreement with Syria and Jordan placing Nasser in command of all three armies. The continued blockade of the Suez Canal and Gulf of Aqaba to Israeli shipping, combined with the increased fedayeen attacks and the bellicosity of recent Arab statements, prompted Israel, with the backing of Britain and France, to attack Egypt on October 29, 1956. ↑ "The Jewish Virtual Library, The Sinai-Suez Campaign: Background & Overview". In 1955, Egyptian President Gamal Abdel Nasser began to import arms from the Soviet Bloc to build his arsenal for the confrontation with Israel. In the short-term, however, he employed a new tactic to prosecute Egypt's war with Israel. He announced it on August 31, 1955: Egypt has decided to dispatch her heroes, the disciples of Pharaoh and the sons of Islam and they will cleanse the land of Palestine....There will be no peace on Israel's border because we demand vengeance, and vengeance is Israel's death. These “heroes” were Arab terrorists, or fedayeen, trained and equipped by Egyptian Intelligence to engage in hostile action on the border and infiltrate Israel to commit acts of sabotage and murder. ↑ Alan Dowty (20 June 2005). Israel/Palestine. Polity. pp. 102–. ISBN 978-0-7456-3202-5. Gamal Abdel Nasser, who declared in one speech that "Egypt has decided to dispatch her heroes, the disciples of Pharaoh and the sons of Islam and they will cleanse the land of Palestine....There will be no peace on Israel's border because we demand vengeance, and vengeance is Israel's death. "...The level of violence against Israelis, soldiers and civilians alike, seemed to be rising inexorably. ↑ Ian J. Bickerton (15 September 2009). The Arab-Israeli Conflict: A History. Reaktion Books. p. 101. ISBN 978-1-86189-527-1. (p. 101) To them the murderous fedayeen raids and constant harassment were just another form of Arab warfare against Israel...(p. 102) Israel's aims were to capture the Sinai peninsula in order to open the straits of Tiran to Israeli shipping, and to seize the Gaza strip to end fedayeen attacks. ↑ "The Six Day War – May 1967, one moment before – Israel News, Ynetnews". Ynetnews.com. 20 June 1995. Retrieved 9 September 2012. ↑ "Ben Gurion Receives Bublick Award; Gives It to University As Prize for Essay on Plato" (10 August 1949). Jewish Telegraphic Agency. www.jta.org. Retrieved 2016-07-01. ↑ "List of Bialik Prize recipients 1933–2004" (PDF) (in Hebrew). Tel Aviv Municipality website. Archived from the original (PDF) on 17 December 2007. ↑ "BEN-GURION, DAVID (1886–1973)". English Heritage. Retrieved 20 October 2012. ↑ Byron, Joseph (15 May 2010). "Paris Mayor inaugurates David Ben-Gurion esplanade along Seine river, rejects protests". European Jewish Press. Archived from the original on 5 April 2012. Retrieved 10 November 2011. ↑ "BANKNOTE COLLECTION". Banknote.ws. Retrieved 3 August 2012. Aronson, Shlomo (2011). David Ben-Gurion and the Jewish Renaissance. New York: Cambridge University Press. ISBN 978-0-521-19748-9. .
Peres, Shimon (2011). Ben-Gurion, Schocken Pub., ISBN 978-0-8052-4282-9. Teveth, Shabtai (1985). Ben-Gurion and the Palestinian Arabs: from peace to war. Oxford University Press. ISBN 978-0-19-503562-9. Teveth, Shabtai (1996). Ben-Gurion and the Holocaust. Harcourt Brace & Co.
Teveth, Shabtai (1997). The Burning Ground. A biography of David Ben-Gurion. Schoken, Tel Aviv. Wikimedia Commons has media related to David Ben-Gurion .